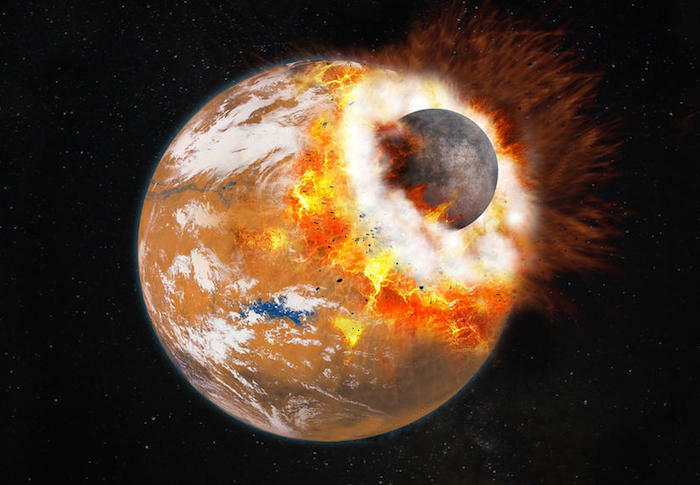 Artist's impression of the giant impact that would have given birth to Phobos and Deimos. The colliding object is about 1/3 the size of Mars—which at the time may have had a thicker atmosphere and water on its surface. The aura of mystery surrounding Mars has long been intensified by its curious pair of moons: Phobos and Deimos, whose origins have remained clouded until now. Scientists have long hesitated between two hypotheses. The first suggests that the moons are asteroids like those found in the belt between Jupiter and Mars; but why they should have been trapped around Mars remains unclear. An alternative theory posits that the moons formed from the debris of a collision between Mars and a protoplanet—a planet in the making; here though, uncertainty has hovered over the mechanism producing two small satellites. “A major difficulty has been to explain why a giant impact on Mars would have left two moons so different from our own Moon, a huge single mass, that also formed from Earth undergoing such an impact,” explains planetary scientist Sébastien Charnoz of the IPG,2 who contributed to the new study. To shed light on this puzzle, the researchers3 pooled their expertise in astrophysics, planetary science, mathematics and computer science to create complex models running a range of hydrodynamic and numerical simulations able to recreate the sequence of past events. Their findings back up the second hypothesis of an almighty collision while also, for the first time, coherently filling in the gaps to explain how two moons emerged from the crash debris. A mission is scheduled to bring back samples from Phobos by 2026. According to the simulations, Mars suffered a colossal impact with a body three times smaller some 4 to 4.5 billion years ago. Debris from the collision initially accumulated into a long disk around Mars, resembling one of Saturn’s rings. Within this disk, an enormous moon a thousand times the mass of Phobos gradually formed—similar to the way in which our Moon amassed from debris created by Earth’s impact. The new study innovates by identifying the crucial factor differentiating moon formation around Mars and Earth: the planets’ differing rotation speeds, prompting “completely different tidal actions,” explains Charnoz. The scientist indicates that at the time of their respective giant impacts, “Earth took less than 4 hours to spin on its axis whereas Mars rotated very slowly over a 24-hour period.” The upshot of this divergence is that Earth kept a single large moon whereas debris from the Mars collision further collected into a dozen smaller moons alongside a larger companion. Eventually, Martian tide action due to the planet’s slow rotation caused most of the moons, including the largest one, to fall back onto the planet’s surface, leaving only the two most distant ones: Phobos and Deimos. Conversely, the Earth’s fast rotation pushed its moon further away. 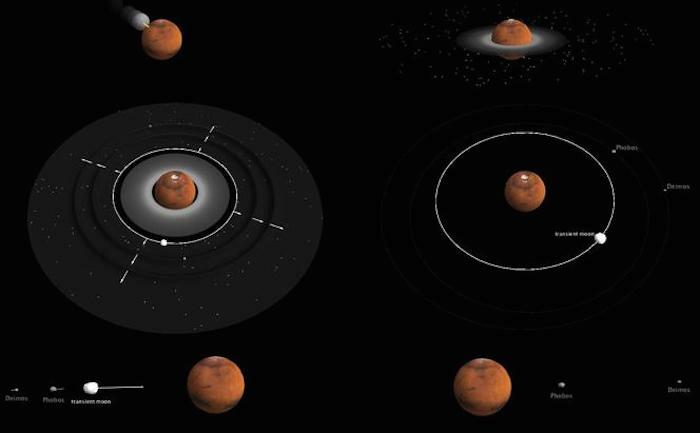 Diagram showing the six phases of formation of Deimos and Phobos around Mars. Even if concrete evidence is still required to confirm the team’s scenario, parallel findings certainly seem to back it up. A recent French study on the orbital and physical properties of the Martian moons points towards their formation from a colossal impact.4 And further plans are underway to gather more conclusive evidence. The Japan Aerospace Exploration Agency (JAXA) has announced a space mission commencing in 2022, with an expected return to Earth in 2026. “Its objective is to carry out close-up remote sensing and in-situ observations of both Phobos and Deimos, and to bring back samples from Phobos,” says Hyodo. 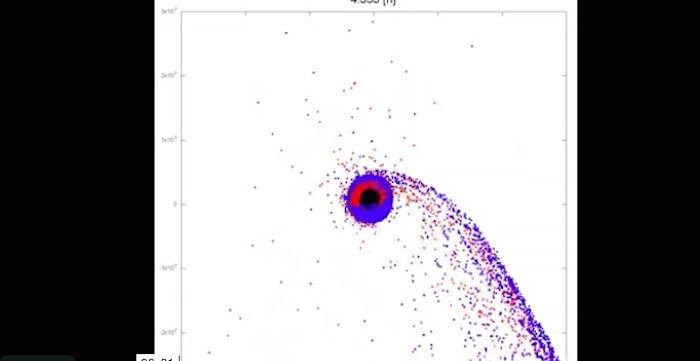 The current study’s Franco-Belgian-Japanese collaboration has an exciting role to look forward to in this mission: JAXA will enlist them to conduct tests on the samples to determine whether this moon is indeed composed of a mixture of Martian mantle and debris from the vanished protoplanet as implied by their simulations. 1. P. Rosenblatt et al., “Accretion of Phobos and Deimos in an extended debris disc stirred by transient moons,” Nature Geoscience, 2016. DOI: 10.1038/NGEO2742. 2. Institut de Physique du Globe de Paris (CNRS / Université Paris Diderot). 3. From Université Paris Diderot, Royal Observatory of Belgium, Université de Rennes 1, CNRS and Earth Life Science Institute (Tokyo Institute of Technology), with additional support from IPGP, the Labex UnivEarthS and Kobe University. 4. T. Ronnet et al., “Reconciling the Orbital and Physical Properties of the Martian Moons,” Astrophysical Journal, forthcoming.